You’ll have to wait a bit longer for more Force Awakens footage. Do we now know what disaster kicks off Marvel’s Civil War? Everyone you could possibly want is allegedly back on Twin Peaks. Plus, teasers for Universal’s new Monster universe, new 12 Monkeys casting, and even more Last Ship. To Me, My Spoilers! The international incident in the film involving the Avengers that results in collateral damage involves Captain America and Scarlet Witch who are trying to apprehend Crossbones. The only problem is that Crossbones is wearing a suicide vest full of nasty explosives. In order to protect the civilians on the ground, Captain America orders Scarlet Witch to levitate Crossbones above ground. She does and unfortunately is unable to contain the massive explosion that sets off near a populated building causing death and destruction. You know the drill with unnamed sources giving out rumors—draw a pinch from your salt reserves for this one. I think I can confirm it, but I really don’t know much more than anybody else. I think there was some lost-in-translation quality to the way it was received, because I promise you there will be horror in these movies. It is our life goal to make a horror movie. The tricky part is actually how you combine horror with either adventure or suspense or action and be true to all the genres together. In some way, ‘Mummy,’ dating all the way back to the Karloff movie, was the first to do that. It was the first to combine horror with — I wouldn’t say action, but certainly a lot of suspense. So it’s more about how you blend the different elements and stay true to each one, but there will definitely be horror in the monster movies. … We will hopefully serve it up good and plenty. It is true, we are showing no footage, behind the scenes or otherwise. In the fall, there’ll be a trailer. We’re thrilled to go to D23 and meet the fans, but it’s a tricky thing to try and rush [footage] for a convention or preexisting event that would, of course, be fun to show something at. 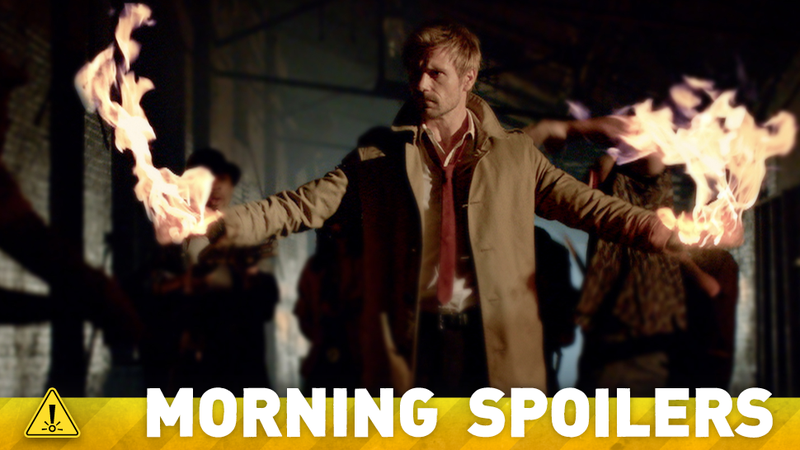 John Constantine is a weather worn exorcist and expert on the supernatural and the occult. He is a detective, magician, and a hunter of demons, and will provide critical support to Oliver (Stephen Amell) when arrows aren’t enough. Unlike Thea, who wasn’t fully dead, the consequences of using the pit on someone as dead as Sara was creates some unforeseen difficulties, and John Constantine is uniquely suited to help our team deal with those. I think you should be optimistic that the people that you want will be there and then there will be surprises in addition. Happily, there will be no other directors. David Lynch is directing the whole thing. He’s directing it like one long movie is how he’s approaching it. What’s great about our show is in our world we don’t even know about that other show. We don’t know about what’s coming or what this whole phenomenon is. So the audience knows so much more than we do and it’s kind of like we’re just sort of carrying on, trying to carry on with our normal lives — like go pick up the kids from school. Oh, the school’s not really a school anymore. Oh, we’ve got to go and get that stuff to go to the library, and the library’s overrun, and oh, we’ve got to go to the emergency ward. So this discovering, it’s more like a natural disaster-type setup where there’s a natural disaster, whatever this virus is or this disease that sort of overrun our nation. Finally, here’s a new picture from season 2, teasing a “different kind of circus” coming to the show. Additional reporting by Gordon Jackson and Charlie Jane Anders. Top image: Constantine, God rest its soul.